I was scheduled to take the brand new Tartan 395 out for a sail on the Tuesday after the Annapolis sailboat show in October. But, at 4 pm when we were to set sail, the wind died completely leaving Back Creek, The Severn River and the Chesapeake Bay as glassy as a mirror. Consulting with Tartan’s Michael Tamulaites, it was decided to abort the mission and reschedule for the next morning when the Windy app on my phone suggested we’d have six to eight knots of breeze. Not a gale, but enough to fill the sails. We met up early and were the first customers at the fuel dock. The 395 is a very manageable size for two people. It maneuvers well under power and is light enough to manhandle around tight slips and docks. We topped up the fuel and as we did we were watching the flags around the creek and the tops of the tall pine trees for a sign of wind. It was there, so we revved up the 40-horse power diesel, which was turning a folding prop on the sail-drive, and slipped smoothly out into open water. The 395 has twin wheels with the engine controls at knee level on the starboard side. At full revs of 3200 rpms, the boat steamed straight ahead at eight knots while at cruising revs of 2200 rpms it maintained a speed of 6.7 knots while burning under half a gallon of fuel per hour. With 40 gallons in the tank, the 395 will have a safe cruising range under power of about 250 miles. With the sail drive being quite far forward and behind the keel, there was very little prop wash or virbration on the helm, even at maximum revs. The rudder is all the way aft and quite large so when we put the boat through a hard turn, she actually turned inside her own length. It was impressive to see just how tighly it turned and how nimble it was. The rudder had a very solid feel as we turned the boat sharply. This is all good for maneuvering in tight spaces. I usually get right into the sailing performance of a new boat in a review like this and focus on design and construction details later. But, the 395, like the rest of the Tartan fleet, is a bit more complicated than most modern production boats, so understanding how the boat was designed and built will help explain its sailing characteristics. Tim Jackett has been the designer of record at Tartan for decades and is now one of the owners of the company. The 395 is the first new boat to be debuted by the company in quite a few years. The hull is a pure cruising shape without hard edges or chines and is rounded below the waterline. This will give the boat a soft motion through the waves. The boat has three keel options, a deep keel at six feet, two inches, a shallow beaver-tail keel at four feet, 10 inches and a keel-centerboard that draws only four-feet, three inches when up and all the way to eight-feet, three inches when all the way down. The deep fin keel will offer the best sailing performance but the keel-centerboard will compare favorably. The beaver-tail keel has wings or a foil-shaped bulb at the bottom to lower the boat’s center of gravity while still maintaining a shoal draft. The end-plate effect of the beaver tails greatly improves the lift from the keel’s foil shape. The spade rudder is large and has a highly refined foil shape, so it produces the minimum drag while also providing a very fine feel to the helm underway. The foil shape also adds lift to the hull as the boat sails close to the wind. 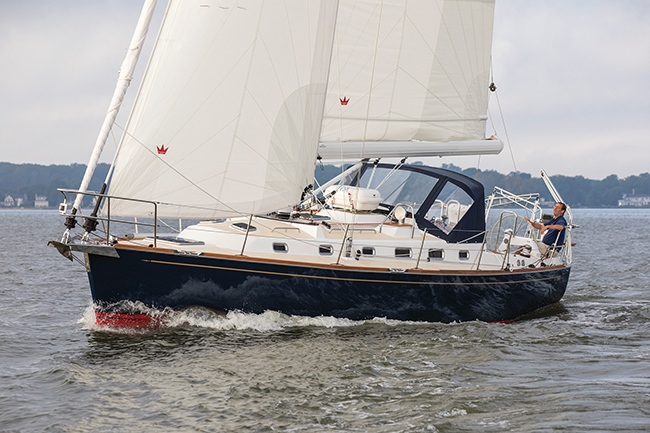 The 395, like all Tartan sailboats, has a core composite hull that is laminated with E-glass and modified epoxy resins. The core is closed cell foam so it cannot absorb water. Plus, the laminate is vacuum-bagged to eliminate any voids and to assure the complete saturation of resin into the glass layup. The result is a completely inert hull that is lighter and stiffer than conventional solid glass hulls of hulls cored with organic materials like balsa wood. Reducing the weight and lowering the center ofgravity, makes the boat both better in light airs and stiffer in a breeze. The deck is also an infused, cored structure made of E-glass and modified epoxy resin. The boat has a balsa core which provids excellent strength to weight properties, stiffness and very good sound and heat insulation. Where ever hardware is mounted on deck, the structure beneath it is solid E-glass for strength and durability. The rig on the 395 starts with a Tartan built carbon fiber mast and swept-back airfoil spreaders. The mast weighs half as much as a comparable aluminum mast and is taller than you will find on comparable modern designs, a design characteristic that allows the boat to have a larger sail plan that is supported by the lower center of gravity or stiffness of the hull. The larger, lighter mast is an essential part of Tartan’s Cruise Control Rig, which offers a large mainsail with a Solent self-tacking jib mounted inside a large high cut reaching sail or genoa. To make the small sail area of the self-tacking jib really work effectively, particularly in light airs, the design needs the taller, light rig which spreads more sail area in the mainsail. Off the wind the large headsail is a real boon and adds a lot of boat speed. Plus, both the Solent jib and the reaching sail can be handled from the cockpit so no one has to venture onto the foredeck. For those who will be racing the 395 in point to point events offshore will want to add a spinnaker pole and spinnaker, either a symmetrical chute or an asym. The pole will be handy, too, for sailing wing-and-wing dead downwind. So, the concept is to build a boat that is in design harmony. The high tech hull construction and carbon mast lower the boat’s center of gravity and make it lighter than average. This then enhances the easy-to-use self tacking jib that eliminates winch grinding upwind. Finally, with CCR, you have plenty of off the wind power in the big mainsail and the large reaching sail. 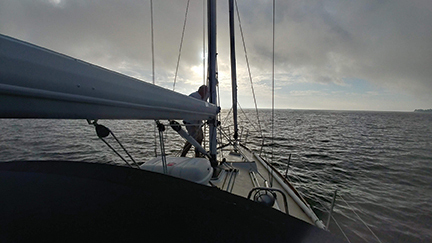 As we motored the 395 into the bay, we headed up and hoisted the large mainsail from it’s in-boom roller furler. This is an option from Tartan and combines the ease of roller furling with the performance of a proper, full roach high-tech mainsail. In-boom furling systems have evolved and sailmakers have learned how to build sails that really work well with them. As we fell off the wind, Michael rolled out the Solent jib and trimmed for close hauled sailing. Even in the mild eight knots of breeze, the 395 put her shoulder down a little and accelerated. The helm felt very light and it was easy to get the boat into the upwind groove. We threw a couple of tacks just by turning the wheel and found that in the light stuff she could sail at about 42 degrees to the true wind. That’s a nice close angle that makes upwind sailing more fun. After sailing right out into the bay, the breeze began to die so we rolled up the jib, fell off the wind and rolled out the reaching sail. That’s what we needed. The sail filled and when we got to about 140 degrees off the true wind, the boat found its balance and started to sail really nicely. The combination of a large mainsail, a light hull, efficient underwater blades and the right amount of sail area was the key to the light wind sailing performance. As we got back to the entrance to Back Creek, we rolled up the headsail, rolled down the mainsail and started the engine. With this rig, sail handing is a breeze and you always can deploy the right combination of sails and sail area to allow the boat to sail in balance and at optimum speed. 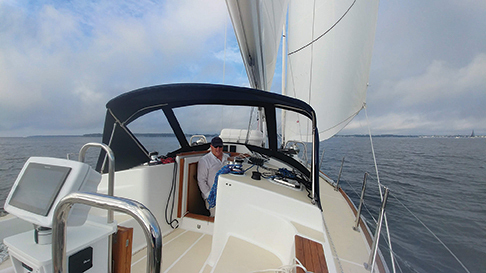 When you climb down the companionway of the new 395 you can see at once that you are not on a production boat that was built to a price but instead on a modern, yacht-quality cruiser that will appeal to experienced and discerning owners who value traditional joinery and classic American yacht styling. The boat has two double cabins, one forward and one in the starboard quarter cabin. These are both “master cabin” but the after berth is slightly wider while the forward cabin has more living space. The salon has the U-shaped galley to starboard and the chart table and large head across from it to port. The galley has double sinks, a three-burner stove and oven and a large counter top fridge. The head is large and has good headroom. Plus, it has a separate shower stall that will make life aboard more comfortable and will also double as a good place to hang wet foul weather gear. The engine is under the companionway steps and has excellent access from the front and both sides through hatches in the aft cabin and the head. Checking the oil and topping up coolant will be a snap. The dinette table is not quite on the centerline so you can walk forward easily. It has a U-shaped settee to starboard where you can sit four for dinner. The table also has a large drop leaf that allows diners to sit on the port setee for dinner. 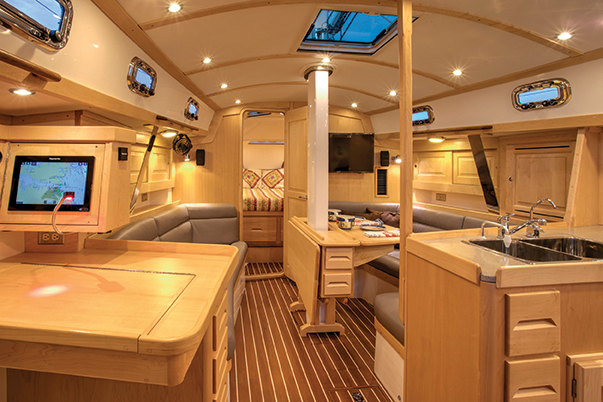 The 395 comes standard with an all maple interior, white ceiling liners with maple battens and maple hull liners. Door and drawer fronts are solid maple and all doors have raised panels. The ambiance is both traditional and very light and airy. 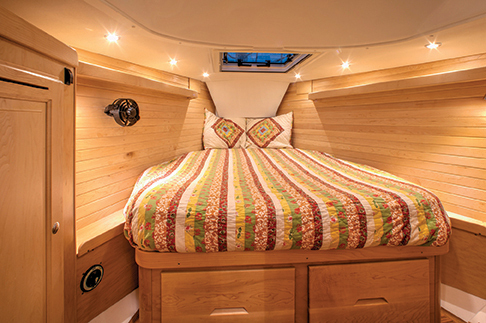 The light colored maple creates a sense of space and warmth that you rarely find on boats of this size. There is plenty of storage in all three cabins and in the galley so a couple wil be able to move aboard and cruise comfortably on a fulltime basis. Plus, guests will always feel comfortable and have plenty of private space while on board. Tartan is a venerable American brand of boats so it is good for those of us who have sailed Tartans all our lives to see such a beautiful new model launched that once again establishes Tartan as a leading American builder of cruising boats and racer-cruisers. Sail area(upwind) 794 sq. ft.
Sail area (w/reacher) 1,112 sq. ft.